Taking a closer look at the Ghost Revenant X system, the first thing that catches the eye is the case. Ghost have gone with the new and gorgeous NZXT S340 Elite case which features a large tempered glass window as well as a HDMI pass through designed for users with VR (virtual reality) headsets. Through the glass, Ghost have installed the monstrous ASUS GTX 1080 STRIX graphics card which quite frankly, will more than handle games at 1080p and 1440p without issue. 4K is still a grey area, although the GTX 1080 is one of the best graphics cards on the market and will be fine at medium to high settings at such a high resolution. 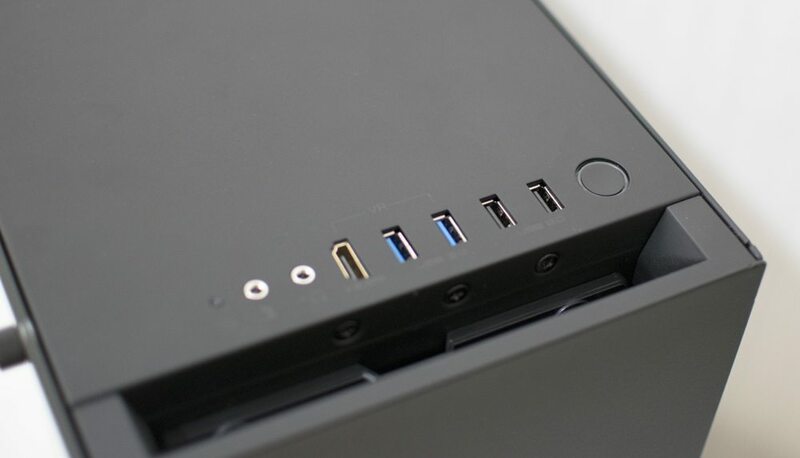 The NZXT S340 Elite has a decent front panel I/O offering with 2 x USB 3.0 ports, 2 x USB 2.0 ports, 2 x 3.5mm front panel audio jacks and a pass-through HDMI which allows you to plug your VR headset in at the front; perfect for those who don’t want to have to constantly fiddle around at the back. With the tempered glass window off, we can get a better look at the system installed on the inside. On the bottom right, Ghost have utilised the 2.5” SSD mount on the S340 Elite which looks pretty good in my opinion; they have used a Samsung drive, but they aren’t advertising a specific brand/model on their listing. Other components used are the ASUS Z170 Pro Gaming AURA which has RGB functionality for those who wish to customise how the interior glows! This particular motherboard is middle of the range in terms of specifications and offers great value. It is worth noting that the NZXT S340 Elite has a very good interior and plenty of room for upgrades if you wish to do so. Cooling the Revenant X is the NZXT kraken X61 CPU cooler which features a large 280mm radiator; a pretty good cooler for keeping the Intel i7 6700K cool. Even though the processor is overclockable, Ghost has left this at stock settings, so please do so knowing that it will be at your own risk. Ghost has chosen the Corsair Vengeance LPX 16GB 2666MHz dual channel memory kit to go with the Revenant X system and I can’t really disagree with their choice; Corsair is popular, solid and the modules come with a lifetime guarantee. 2666MHz memory is middle of the road as far as DDR4 goes; Ghost haven’t actually specified which memory comes installed in the system via their specifications, so hopefully they remain with this particular kit. After removing the rear side panel, the power supply can be located towards the rear. I was disappointed to find a basic Corsair CX600M power supply installed, as not only does Ghost list an EVGA one, but it just makes this system feel less “premium” in my opinion. The cable management is pretty decent though and full use of the NZXT S340 Elites cable management options has been used. When powered up, the Revenant X illuminates with such radiance. The NZXT Kraken X61 has a customisable LED (via the NZXT CAM software) built into the CPU block, with the ASUS Z170 Pro Gaming AURA also having RGB functionality. The NZXT Hue+ is also present which like the X61 CPU cooler, can be customised thanks to the NZXT CAM software. Even the ASUS GTX 1080 STRIX has RGB lighting featured which makes this a very desirable system for those who want to keep changing the look. Note: We aren’t responsible for any specification changes between the sample supplied to us and one you purchase retail from Ghost. This simple integer benchmark focuses on the branch prediction capabilities and the misprediction penalties of the CPU. It finds the solutions for the classic “Queens problem” on a 10 by 10 sized chessboard. At the same clock speed, theoretically, the processor with the shorter pipeline and smaller misprediction penalties will attain higher benchmark scores. For example — with HyperThreading disabled — the Intel Northwood core processors get higher scores than the Intel Prescott core based ones due to the 20-step vs 31-step long pipeline. CPU Queen Test uses integer MMX, SSE2, and SSSE3 optimizations. PCMark 8 is a complete PC benchmarking solution for Windows 7 and Windows 8. It includes 7 tests combining more than 25 individual workloads covering storage, computation, image and video manipulation, web browsing and gaming. Specifically designed for the full range of PC hardware from netbooks and tablets to notebooks and desktops, PCMark 7 offers complete Windows PC performance testing for home and business use. 3DMark is a computer benchmarking tool created and developed by Futuremark Corporation (formerly MadOnion.com and initially Futuremark) to determine the performance of a computer’s 3D graphic rendering and CPU workload processing capabilities. Running 3DMark produces a 3DMark score, with higher numbers indicating better performance. The 3DMark measurement unit is intended to give a normalized mean for comparing different PC hardware configurations (mostly graphics processing units and central processing units), which proponents such as gamers and overclocking enthusiasts assert is indicative of end-user performance capabilities. CrystalDiskMark is a disk benchmark software that analyses different types of hard drive. Giving sequential benchmark write and read statistics in MB/s. A simple program that is very useful. We have included a seperate graph for the OS/Storage drives. BioShock® Infinite is a first-person shooter like you’ve never seen. Just ask the judges from E3 2011, where the Irrational Games title won over 85 editorial awards, including the Game Critics Awards Best of Show. Set in 1912, players assume the role of former Pinkerton agent Booker DeWitt, sent to the flying city of Columbia on a rescue mission. His target? Elizabeth, imprisoned since childhood. During their daring escape, Booker and Elizabeth form a powerful bond — one that lets Booker augment his own abilities with her world-altering control over the environment. Together, they fight from high-speed Sky-Lines, in the streets and houses of Columbia, on giant Zeppelins, and in the clouds, all while learning to harness an expanding arsenal of weapons and abilities, and immersing players in a story that is not only steeped in profound thrills and surprises. The Division takes place in mid-crisis Manhattan, an open world with destructive environments that are free for players to explore. The player’s mission is to restore order by investigating the source of a virus. The player character can carry three weapons, and explosives like sticky bombs and smart mines to fight against enemies. So the Revenant X has been tested, looked at and prodded with a large pointed finger (mine), but now it’s that time where I give you the lowdown and explain what went right; and of course, what went wrong! Normally when it comes to reviewing a system, everything is pretty straightforward. You already have your testing platform set up, all the specifications in front of you, so it’s really just a case of installing the benchmarks, running tests and what not. 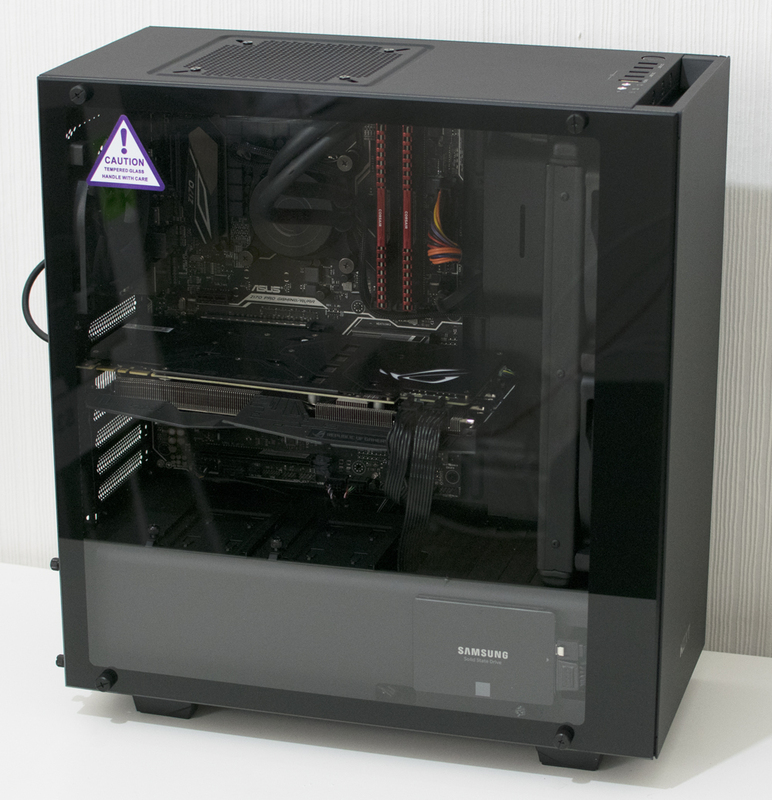 In the case of the Revenant X, I spent half my time trying to figure out what should actually be inside the NZXT S340 Elite and what shouldn’t be; the specifications on the list page didn’t exactly match what I had in front of me. Ignoring the gaping lack of correlation between the listed specification and what’s inside the system, the Ghost Revenant X is a beast of a system. Gaming performance is fantastic and it keeps up respectably with MSIs own Aegis X system; the Revenant X is around £300-400 cheaper which puts this in a much better position in terms of value. Synthetic performance is however a little topsy turvy and with essentially the same processor and memory as the Spectre X, the only real difference is the motherboard performance; it could be better! I think if you consider that the Revenant X system features a ASUS GTX 1080 STRIX and Intel i7 6700K a, you have a very potent and future proof combination on your hands; 1080p, 1440p and even 4K at some settings are easily handled; VR is a complete doddle with this system too, especially due to the features included thanks to the NZXT S340 Elite case. The NZXT S340 Elite is a cracker of a case and the tempered glass window adds such a nice feel to an already good case. The design of the Revenant X is overall good, especially for those who love RGB and everything that comes with it. The NZXT S340 Elite is available in black or white and I feel this system, combined with the white version would literally rock your world! That being said, the only real difference between this system and the previous one we reviewed (Spectre X) is the case, motherboard and graphics card; the SSD is also different too! Overall, the pricing on the Ghost Revenant X is rather good and can be had on Amazon UK for around £1600. Aside from the rather shambolic marketing from Ghost, the Revenant X has the potential to be one of the hottest single GPU systems currently available, especially in the lead up to Christmas 2016. With a good selection of components, one of the best GTX 1080’s on the market in the way of the ASUS STRIX model (if that’s what you actually receive) and the Intel Core i7 6700K Skylake processor, you’re guaranteed to get a good quality, user friendly experience at virtually all of the current mainstream resolutions. Huge thanks to Ghost for sending the Revenant X system in for review.